Discussion in 'The Sound Hound Lounge' started by JefeMaximo, Apr 12, 2016. Robben Ford, Lee Roy Parnell and Joe Robinson. Has anyone seen them? It looks they are coming to my area in a few weeks. A440 and Madison like this. I saw this the other day. Looks interesting and I've never heard of that Australian guitarist even though I'm Australian. I'd go see it if I could. Guitarmy is so much better. catch this tour if you can! Darn. I thought maybe this thread would be about the Outlaws. cottonmike and johnkoz like this. I came in for the same reason. tonyhay, cottonmike and johnkoz like this. I saw him win 'Australia's Got Talent' years ago but have heard little of him since. I'm guessing he has spent a few years overseas. I saw him win 'Australia's Got Talent' years ago but have heard little of him since. Was he the young kid playing acoustic in the Tommy Emmanuel mold? Yes, and I remember thinking so at the time. He played Classical Gas and you could absolutely tell he was a Tommy disciple. He could play that's for sure, but checking out a few recent clips of him, I can see his playing has matured a lot. He is really good. Cool, I think I remember the guy now. Yeah that's his second Dumble. Yeah,I saw them at Guitar town in copper Mtn, co. Like previous posters, I was knocked out by Robinson and wish they played more on each other's tunes instead of taking turns. And robben took a few tunes to get comfortable. It's funny as I think he's basically unknown down here. I saw a bit of the show Saturday night here in Louisville. I went specifically to see Robbin... I don't really know the other two guys. Robben has such amazing phrasing and ideas, his tone was fantastic. He didn't have the Dumble and was playing a reissue BF twin reverb, he had a small pedalboard as well. He played an SG with humbuckers and his trusty Tele. He was easily the loudest (and rightfully so) of the three guitarists. 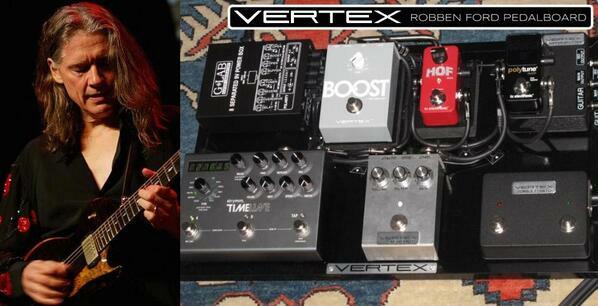 EDIT - I found a pic of his pedalboard online. Anyone know what the 3 knob pedal is? Probably an overdrive. Looks like some sort of Vertex prototype. Possibly the Steel String Clean. I saw them in Louisville. Robben was great, as always and put on a chord comping clinic, while supporting the other guys songs. I love seeing Robben support other artists. Joe was really good and has a unique style, but you could not hear his guitar or vocals well--and I was center (horizontal and vertical), and couldn't believe that such a nice venue could not get a better mix. Of course, Robben was very loud on stage. Lee Roy was very loud too. I thought that sound panels should have been put in front of their amps. It was also surprising that Lee Roy had a BAD pedal board buzz. I guess he doesn't have Mason (Vertex) build his boards. (Just kidding!) You could hear the buzz even when the band played. Lee Roy is a talented song writer and can play, but he and Robben on the same bill was a little odd. He did fine though.